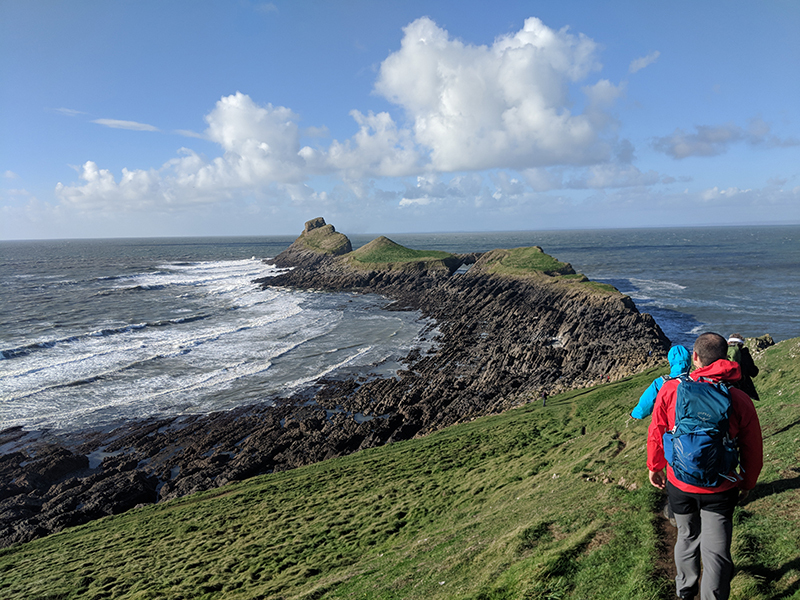 Every year my running club go to Wales for a long weekend in three beautiful cottages along the Gower coast with the intention of running the EnduranceLife Coastal Trail Series races held in November. 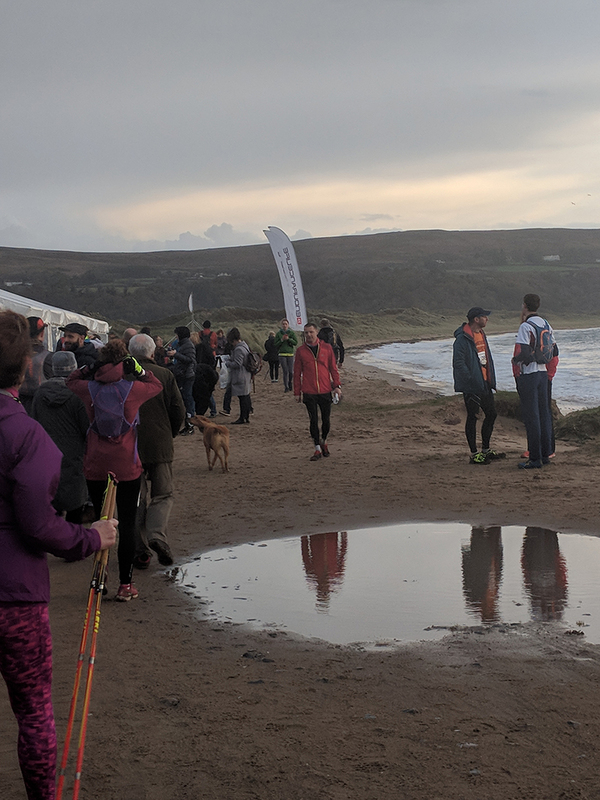 The trip spans from the Friday afternoon through until Monday lunchtime, with car loads of runners arriving throughout the Friday and leaving across Sunday and Monday. As Oscar attends nursery on Fridays and Dan was able to take Monday off from work I was able to spend the whole four days hanging out with friends and as much as I missed Oscar and Dan whilst I was away, it was so lovely to get away and just have a complete break with a bunch of like-minded people. The trip down was fairly fast this year. It had started to rain as we reached the border to Wales (standard Welsh weather!) and was absolutely tipping it down by the time we were headed off to the pub for our Friday night meal and so, so windy. 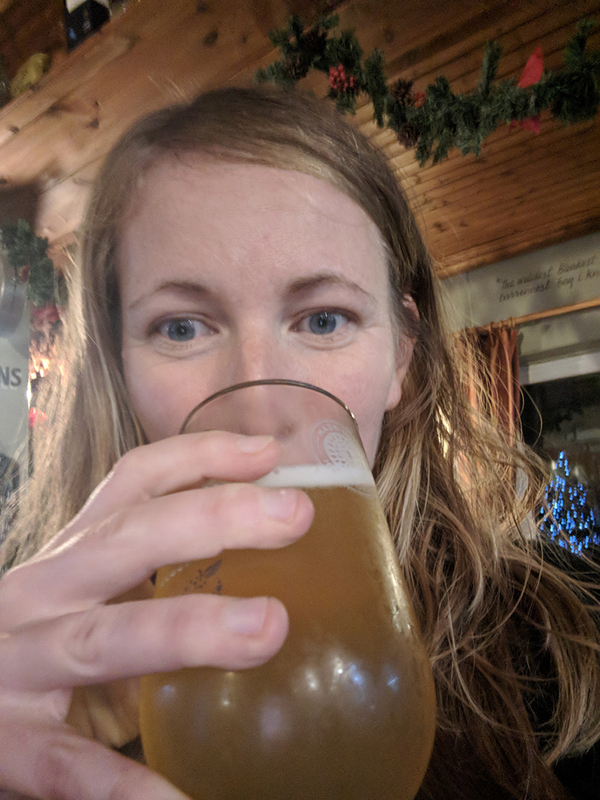 We could barely hear each other talk on the walk down and I instantly regretted bothering to straighten my hair when it became a knotty mess by the time I reached the pub! Nobody stayed up too late on the Friday night. This year the course for the race had changed. 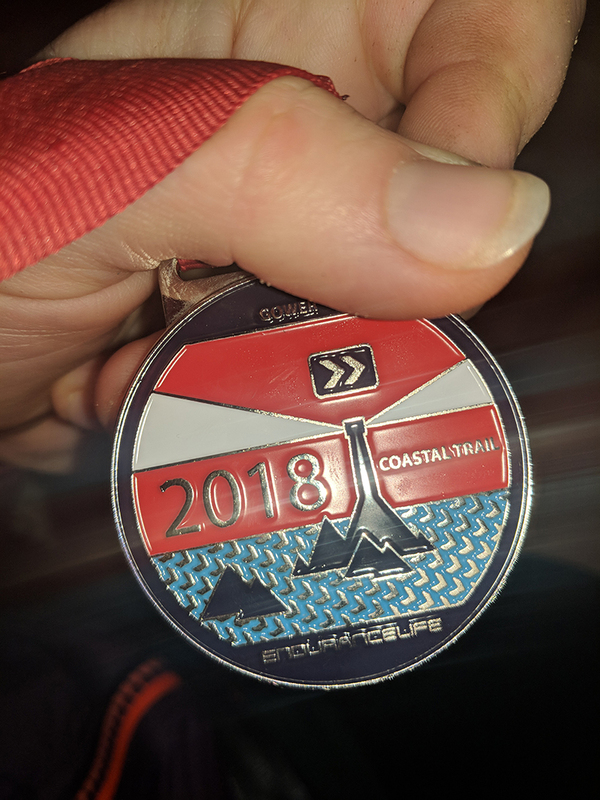 Essentially, it was the same route for us marathoners, but starting and finishing at a different point in the course (about where mile 20 would usually fall, along the final beach). I’ve never run the half marathon route before but I’m told that this had totally changed this year. The half marathoners had to register at the finish the same as us, but were then bussed back to start in a different location. We’ve been used to our cottages being within walking distance of the finish line in previous years and all the runners stumbling back at different times at the end of their races. 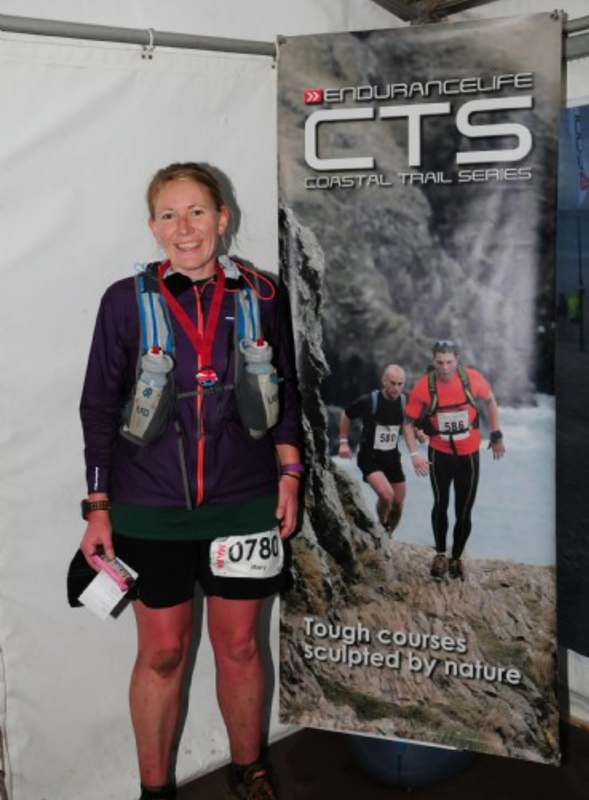 We thought that perhaps this year, with us all having to hang on to the end and then fighting out for hot showers at the same time might prove rather tricky but luckily it didn’t end up too bad. What I didn’t plan on was waking up at 4:30am on race day with incredibly bad period cramps and a killer headache. Oh great, thanks for that body! I jumped into the van with a bunch of others from our club and we set off to the start line, about 10 miles away. The sun was only just beginning to surface and there were deep puddles across the car park from the rain the previous day. The beach itself was tough to move across and my back was killing already! I’m sure I was a delight to be around! I was livid to discover there was no Clif bar in my starter pack! 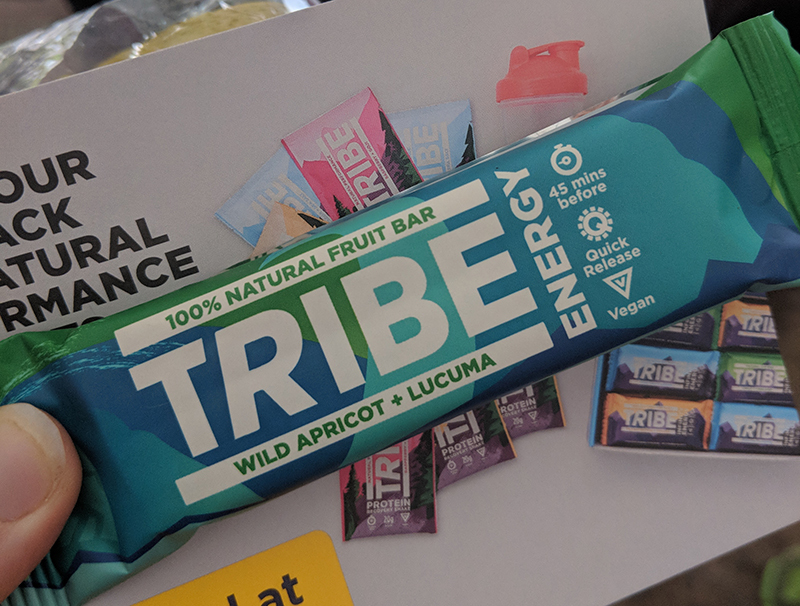 The price of the race had gone up by £10 this year (to £60) and we didn’t even get a Clif bar at the start, just a Tribe bar. I was gutted. It was really turning out to not be my day! 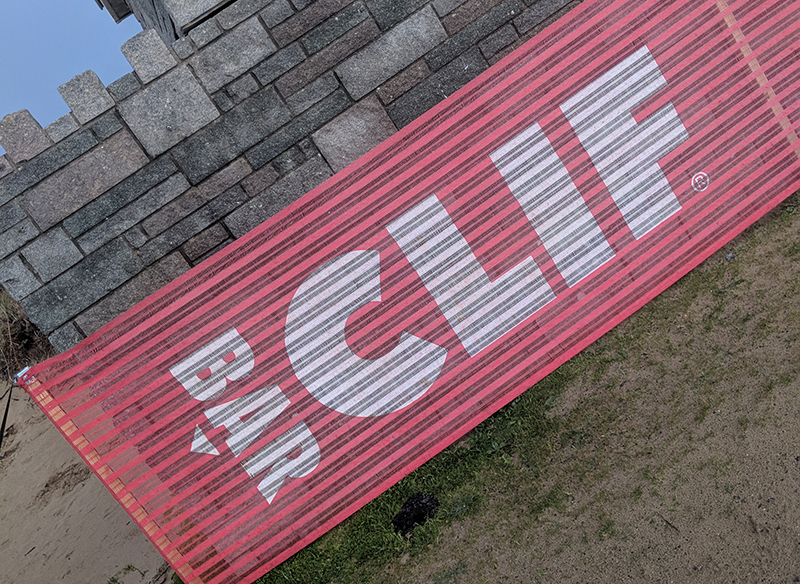 There was even a Clif banner just outside the registration tent to rub it in a little more! After taking a quick photo by the starting flags we raced back to the van for half an hour as the rain began to come again, and hard! 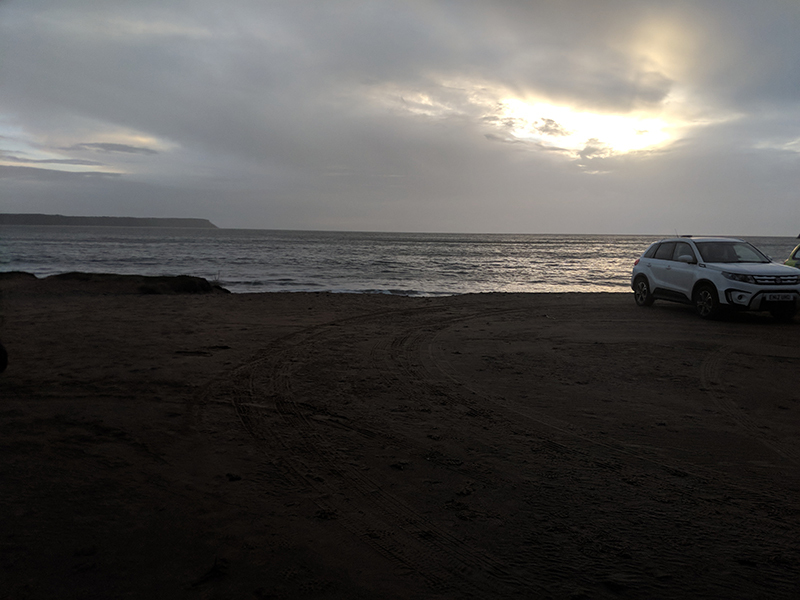 Luckily it had slowed somewhat by the time we needed to emerge from our cars and so we sheltered in the tent until we were summoned for the start. Full wet weather gear required! Five of us set off as a group at the back. A few miles in we saw a teenager come off a quad bike out on the track. He spun to a stop and flipped right off the top. Seemed OK though. Got up and sped back off again. 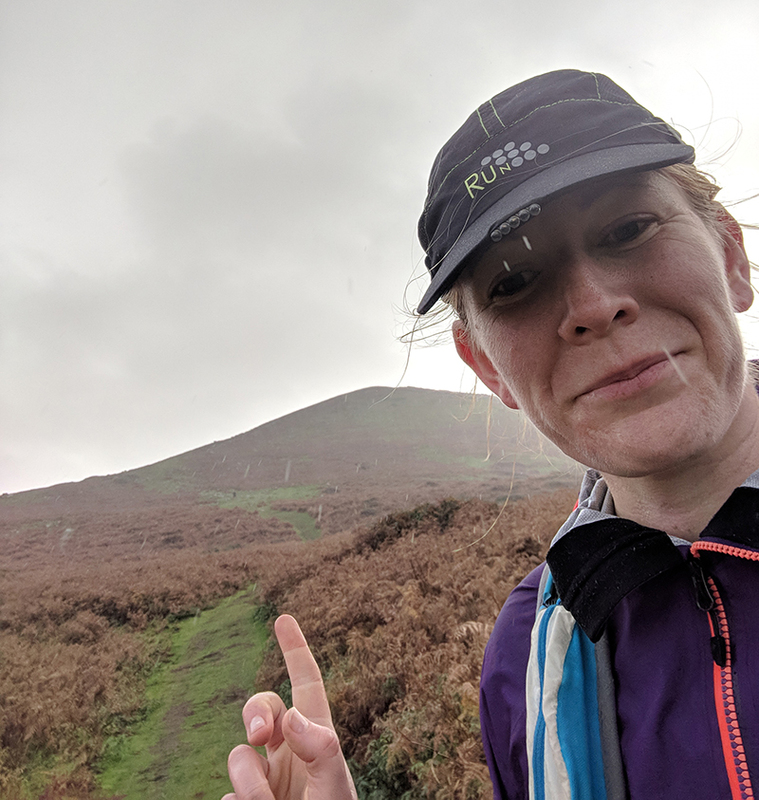 We started chatting to another runner, who I later came across on Instagram when scrolling the #gowermarathon hashtag. Not long after that first checkpoint I carried on along with Guy (who went on to sped off up ahead), leaving the others to run at their pace, knowing that I would get cold if I didn’t continue to move a little faster. It wasn’t long before I came across another runner who I fell instep with for several miles. 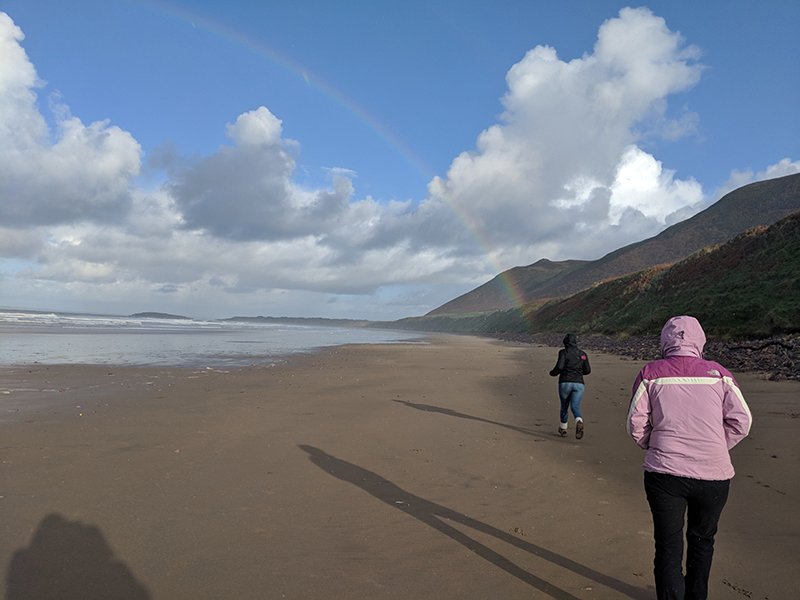 We ran across the long beach together, overshooting the cut through as the marshals had left up the half marathon route directions for further along the beach. I always find beach running hard. Not only is it tough going underfoot, but it’s mentally tough for the scenery to be exactly the same stretching off into the distance. 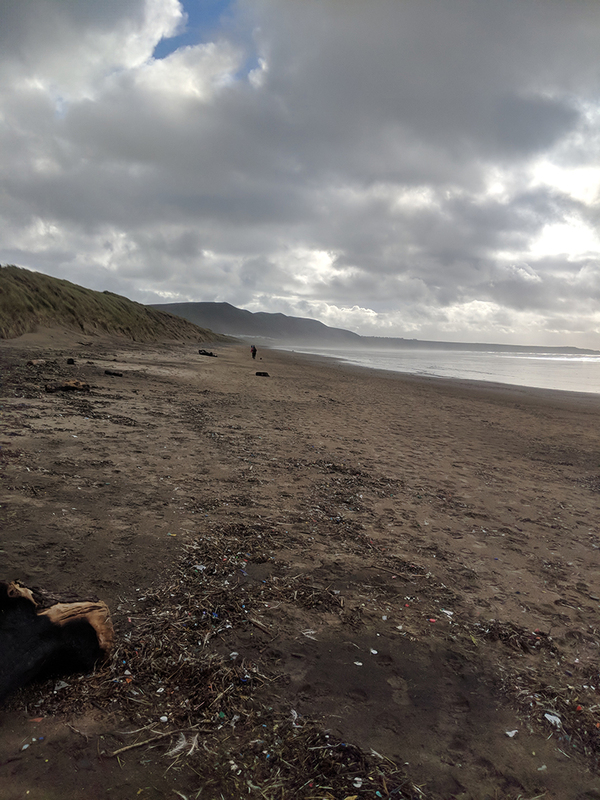 It did feel much easier going round the course in this direction on the beaches though for some reason, despite the wind being against us for most of the way. There was another checkpoint just after the beach. I didn’t need to take anything on board so just checked in and carried on, losing the runner I had spent the last few miles with as he topped up on fluids and snacks here. The hill after this was the toughest of all. It used to fall about 6 miles into the original marathon course (in the other direction) and was always the trickiest part to navigate down. 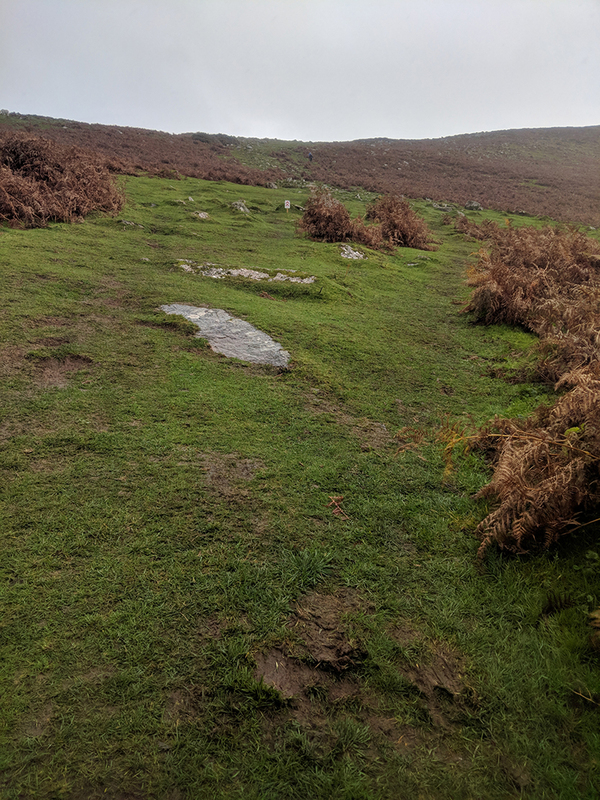 There is a spring which appears in the middle of this hill, making the going underfoot very slippy as a lot of the ground is covered in small rocks which I struggle to get any grip on. One of our runners has been down on his bum every year he’s entered this race and I’ve been very close each time! 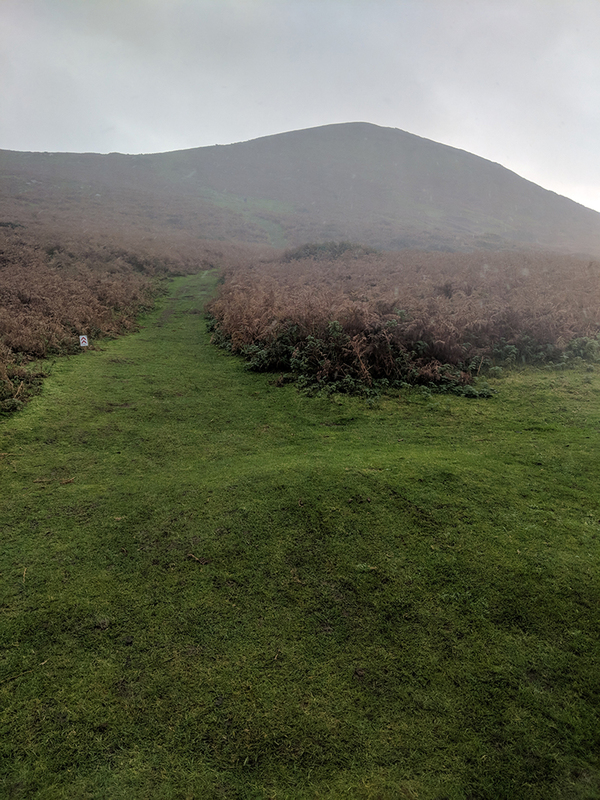 This year though, we were to make our way up the hill instead, along the already-worn muddy track. 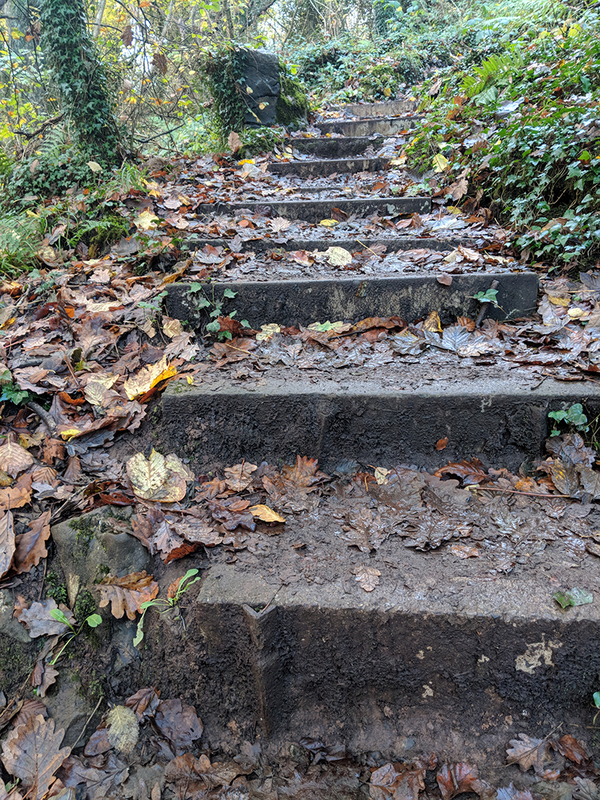 It’s really quite steep in places and it was raining again by now. It’s always worse if you stop – it makes it so hard to get going again afterwards! After the tough hill came the slippery mud. Glad I was wearing an old pair of trail shoes! 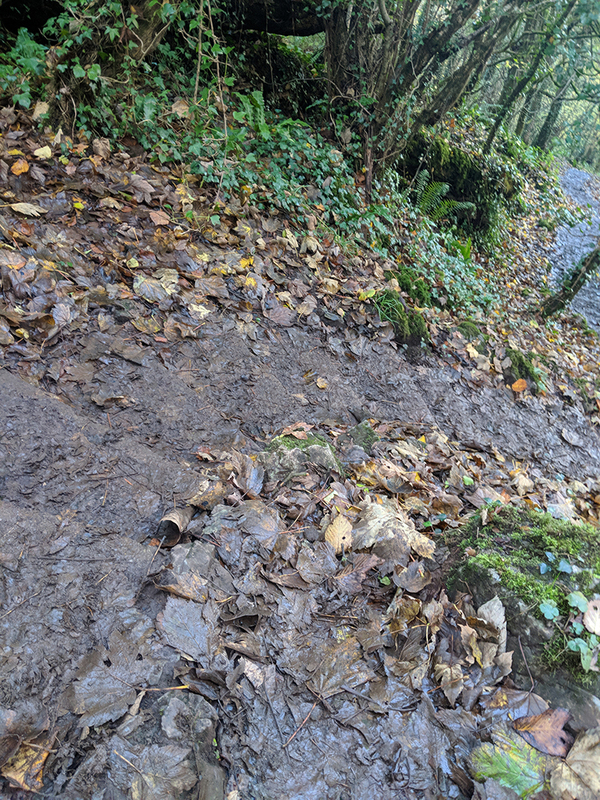 I did fall on one steep downhill that was covered in mud like this. I didn’t fall hard – more just slipped onto my knee on one side. It didn’t bother me at the time. I was just glad that nobody had seen me! 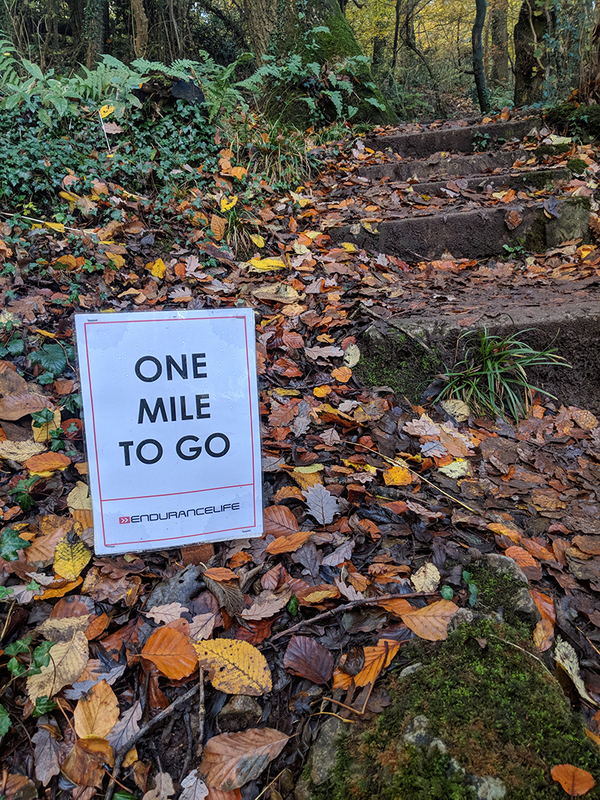 The steps on the course were much tougher going in this direction and they were at 26.5 miles rather than at mile 20! 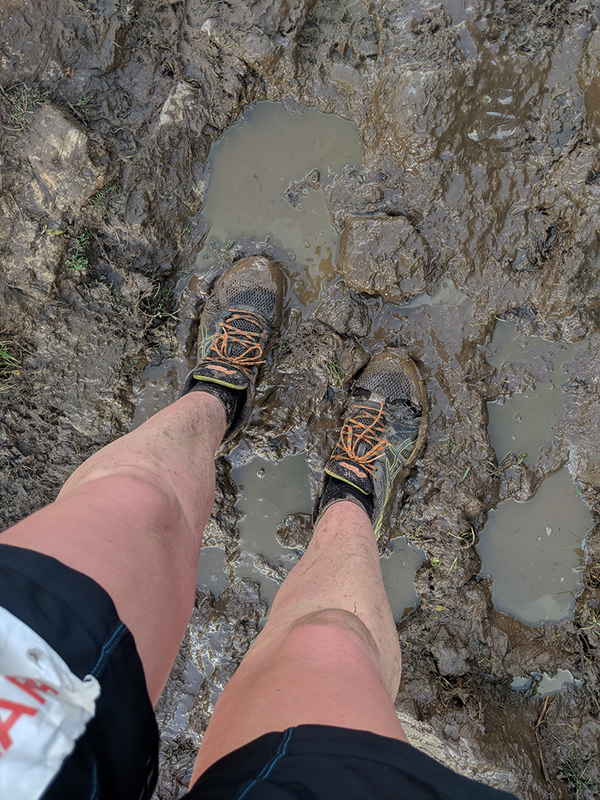 Because so many runners had already been over them they were slippy and muddy. The leaves on top made them even worse. Always the best sign in a race! Heading back down the steps on the other side was just a mudslide! Somehow I made it without injury. A couple of our club members went down on the steep steps though. The finish was a little confusing. 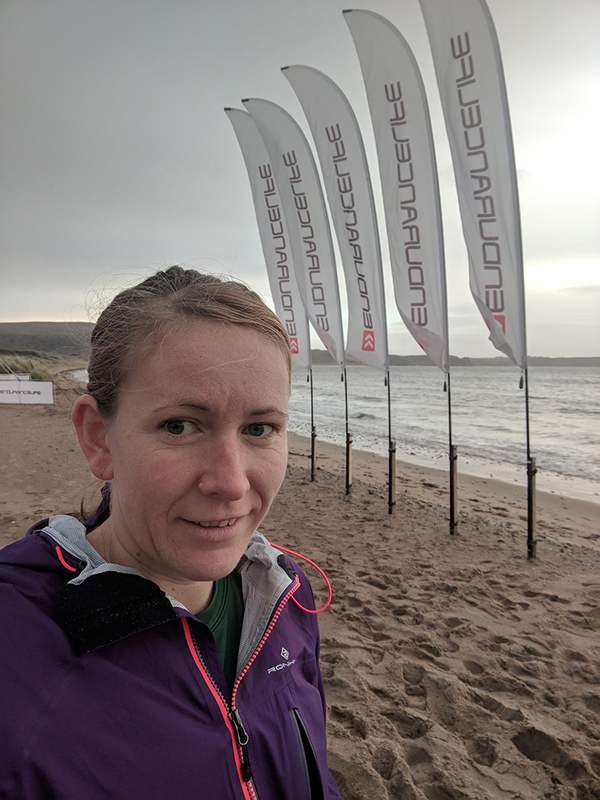 I ran along the seafront past all my club mates who had already finished and were stood waiting to organise lifts back, then turned up and had to run up the bank of sand through the finish, over really choppy footprints that had been left by all the other runners. It was really hard to stay upright! Upon finishing another guy from our club pointed out that my knee looked really swollen and collared the paramedic on duty to take a look. I hopped up onto the massage table and luckily he said that it would just result in some bruising by the look of it, I hadn’t done any serious damage. 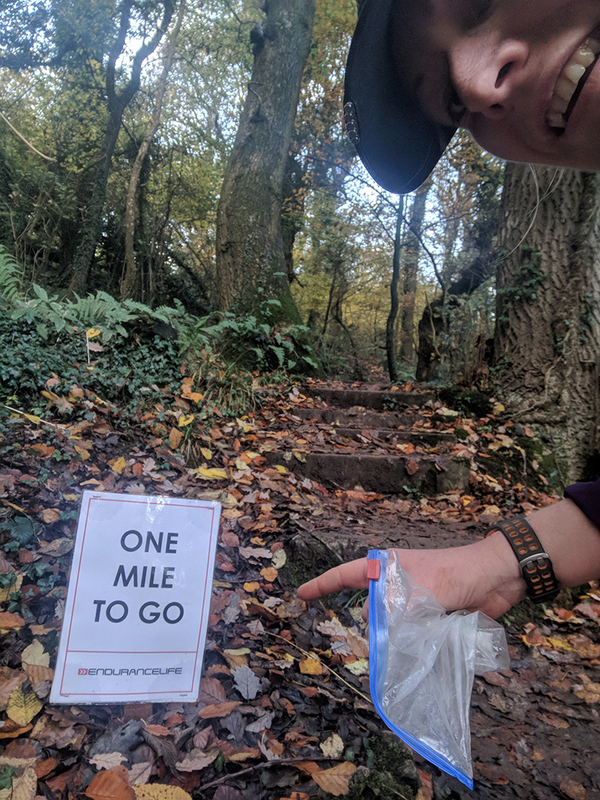 He sent me off with an ice pack, still annoyed that not only had there been no Clif bar at the start, but there was also no Builder’s bar at the end! Those two bars are by far my favourites and I really was gutted that neither of them were at the race! 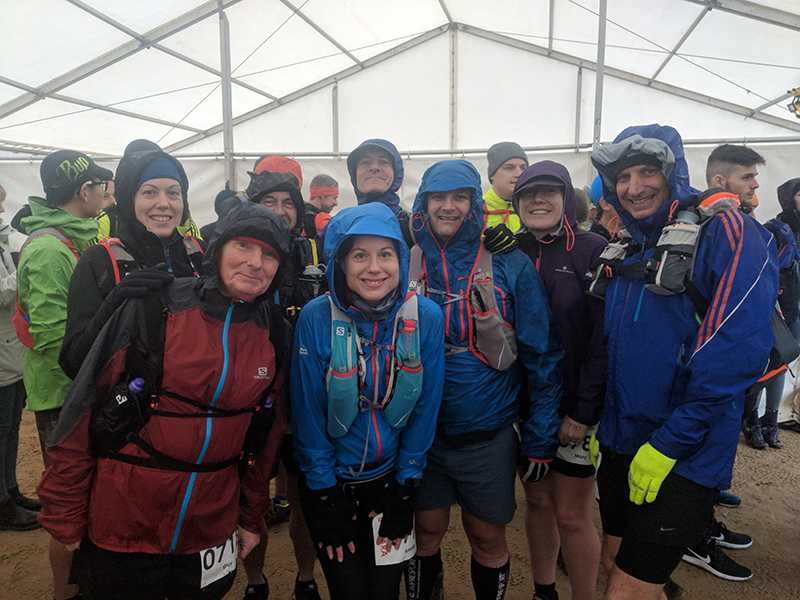 Our last runners came through just in time, – the heavens opened as we leapt into the waiting cars to head back to the cottages. Once showered and changed, we headed back to the pub for dinner, and then returned to the cottages to celebrate with an alcoholic beverage or two! The next morning we made our usual walk down to the beach as a group. There was a rainbow so close we thought we’d be able to stand at the bottom underneath it. It looked like it touched down on the beach right in front of us! Sarah ran to try and stand in the colours, but it had disappeared by the time she got there. 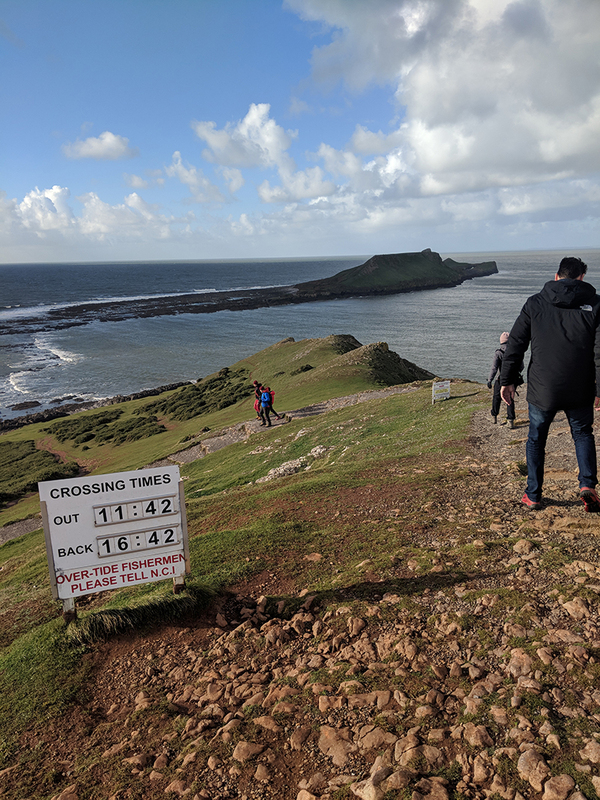 After a quick milkshake in the cafe, those people working the next day had to head off and so the remaining few of us decided to walk across the land to Worm’s Head – an island for all but a few hours of each day. I walked across with a friend in 2015 but the others I was with this year had never been. Last time I went I somehow managed to make it all the way across in Converse, but I made sure to take an old pair of trainers this time! 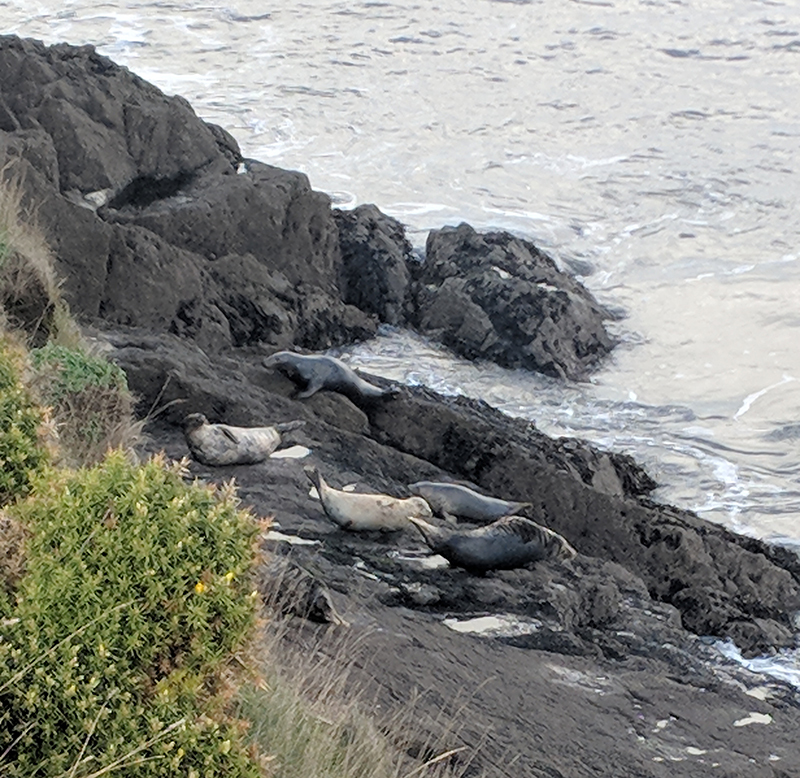 There were loads of seals out sunbathing along one part of the rocks. We ended up only going part way across, with some of the guys not wanting to tackle the tricky terrain further up. But it was still a really lovely morning. Then, back to the pub once more for lunch! It was much quieter on the third night, with most runners having left during the day. I stayed up late to finish watching The Haunting of Hill House. Sooooo good. I really want to watch it again and try and pick up on all the little titbits throughout the story now that I know how it ends. I’m always sad to leave Gower. For a few days it’s nice to get away from reality and feel like I can take a proper break from everything. The signal isn’t great over there, so it is like living in a little mini bubble for the weekend. Have you watched The Haunting of Hill House? Have you seen seals at the beach before? Does your club organise an annual race away? It sounds like a lovely weekend away, although those steps must have been a total killer! Right at the end of the course! Who does that?!?!? !